Far larger amounts of waste resources, which today often end up being wasted or burned, should in the future be recycled much more. There has just been given a grant of 6 million. Dkr. from the Danish Agency for Science and Innovation for this new strategic focus. There are especially large amounts of valuable resources in our household organic waste, amongst textiles, plastics – and construction and demolition waste, which today is wasted by incineration. Therefore, a National Cicular Economy Hub, will today work on resolving these challenges via an interdisciplinary team of six innovation network. 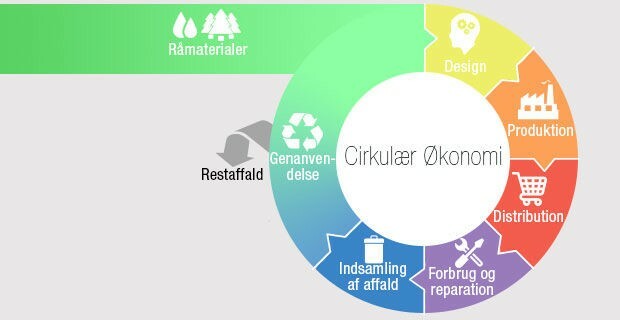 The consortium consists of InnoBYG, DMN -plastcenteret, Innovation Network of Environmental Engineering, INBIOM, Food Network and Life Style & Design Cluster, who is project coordinator. The consortium will work closely with DAKOFA, which sits in the steering committee, and ATS institutes, who also works in the same field. We will work on both transverse activities in cooperation with municipalities, design2disassembly and a certification system as well as in-depth activities within the four hubs: Building & Construction, Clothing, textile & wood, plastic & packaging and agricultural / food.